We had a visitor late in the morning. Almost 37 years ago Doug Fitzgerald and I (along with a large number of other recalcitrants) spent a year training at Portsea in Victoria. He is a keen walker and had just completed 720km of St Olaf’s Way in Norway doing the entire walk in 32 days. Doug informed us he is now 10kg lighter. 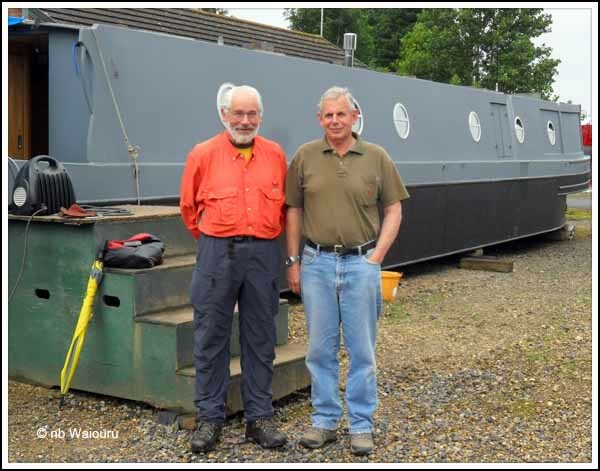 Doug and Tom in front of Waiouru. Of course neither of us has changed in the intervening 37 years! All too soon it was time to walk him back to Aldermaston Railway Station. How good of him to find the time and make the effort to visit! Back at Waiouru Andy had been able to finally fit the bow thruster. 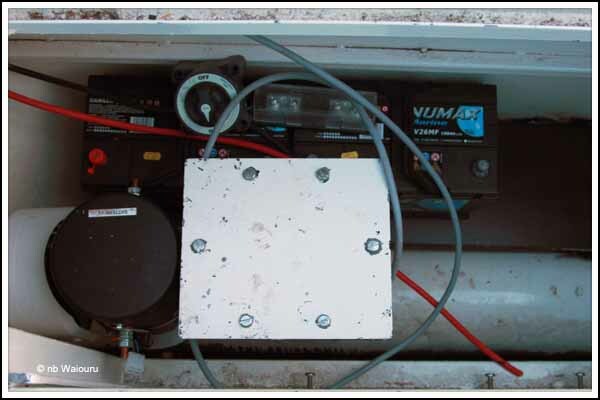 He has also fabricated a platform for the batteries and we discussed the locations for the isolation switch and fuse. I changed my mind about the position of the batteries and opted to have them in the base of the locker, just off the baseplate. Originally I intended to have them stacked one above the other at the port (left) end of the locker. However this would have made the available locker space shorter and we may just need to store a few long items (such as our folding chairs). 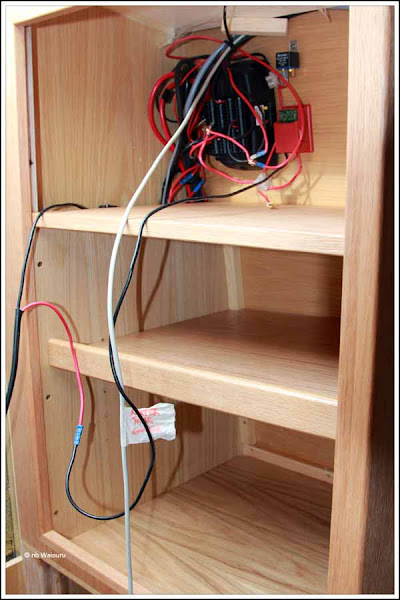 Meanwhile, Richard has fitted the shelving to the electrical cabinet. The top shelf is fixed in place and will be divided vertically. The Empirbus node, relay, fuse, etc will be in the left section and the right will be for long term storage. The second shelf is adjustable. 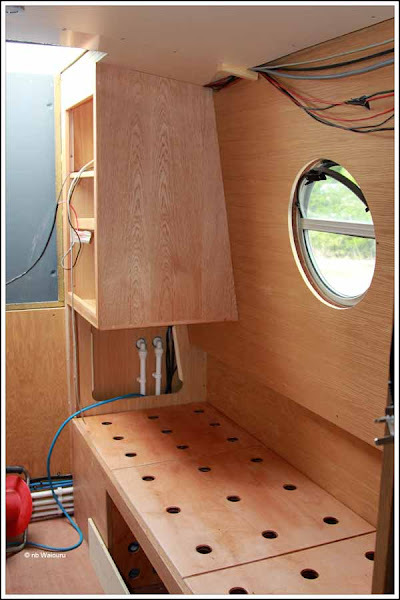 This shelf and the one below will be used to store items for boat maintenance. The front of the cabinet will have two doors. The top door will stop at the top shelf and will have all the gauges on its face. There was just enough time before dinner for me to give the cabinet a final sanding and apply one coat of varnish. James has been working on the two front wardrobes fitting each with three shelves (two are adjustable) and a clothes rail. Tomorrow Richard will hang the two cupboard doors and we’ll then finished the work on the opposite side of the cabin by making the freezer drawer front along with the door on the storage cupboard above it. Time permitting; we’ll also start on the rear steps.